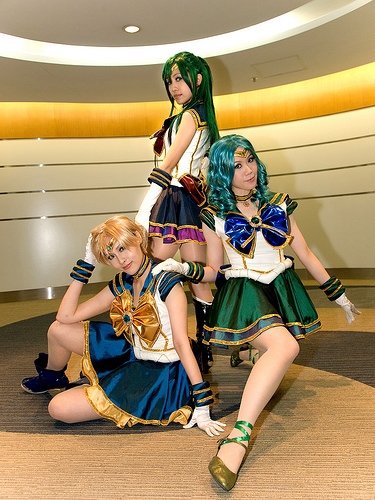 Also known as the “Outer Senshi”, Sailor Uranus, Sailor Pluto, and Sailor Neptune form a secondary group, along with Sailor Saturn. Previously, all of them preferred to work alone, but Sailor Uranus was able to trust Sailor Neptune and Sailor Pluto after fighting along side with them. Sailor Pluto is known as the Guardian of Time, while Sailor Neptune is the Soldier of Ocean, and Sailor Uranus is the Soldier of the Sky. I’m not even sure if they are cosplayers or the official cast of the musical, but they are very pretty. Thanks to Soyoungim for the photo! You are currently browsing the archives for the Sailor Moon Musicals category.